If Hawthorn ever had a serious chance of winning this match then they gave it away in the early minutes when Luke Breust and Shaun Burgoyne both failed to convert set shots you’d usually back them in for. Breust again missed what looked like a sitter late in the second quarter which would have kept the Hawks in touch with the Tigers at a time when the game was starting to slip away from them. In the first quarter, in particular, it seemed it was the Hawks who were better prepared for the game, playing finer football and setting up more realistic opportunities. They managed to put themselves narrowly ahead at the first change, but should really have ended the first term at least two goals in front. Could they have gone on to win from a position like that? We’ll never know for sure, but it certainly would have helped. Hawks fans have seen a Rioli ruin an opposition team’s night at the MCG so many times that it must have been a little shocking to be on the other end of it for once. After his start to the season was delayed by injury, Daniel Rioli has been in solid form through the home-and-away, but once again has risen to the top in finals. Last year he broke out on the big stage to kick a career-high four goals in a preliminary final against GWS, on Thursday night it was three against the Hawks in a qualifier. But his three goals were not simply three goals – they were three little waves of a magic wand, all turning nothing into something and the first two in particular came at times when the match was still a serious arm-wrestle. Only one game in and already the best goal of the finals series has been kicked, as Dustin Martin slotted one from the boundary line that science is still yet to explain. 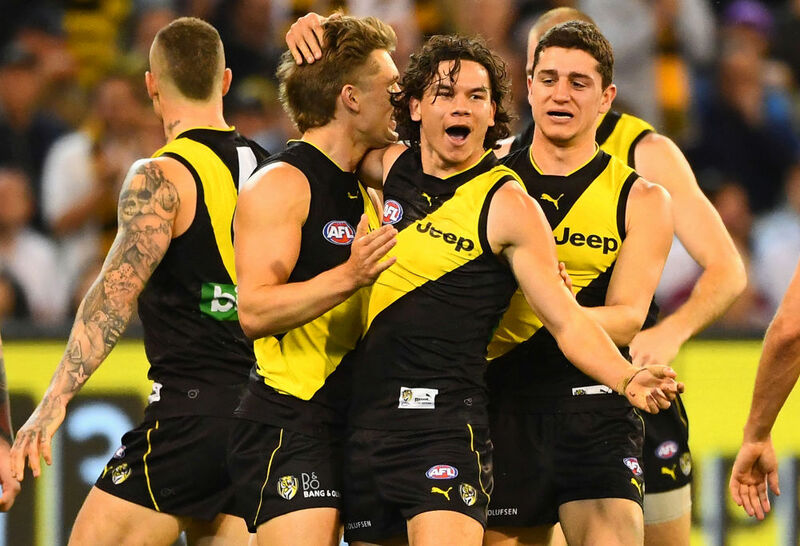 The match arguably turned out to be a bit of a fizzer – threats of an all-time epic tactical takedown from Alastair Clarkson petered out sooner rather than later, and the Tigers were predictably triumphant after halftime. What instead made the game a memorable one will be the handful of incredible goals kicked by the Tigers – they were playing like millionaires, and I suppose for someone like Dustin Martin that is probably a very fair way to play. There could have been a few more too were it not for the pesky post getting in the way, or Damien Hardwick’s beloved goal review system. One thing is for sure, Richmond are not lacking in confidence this September. I for one found it very curious that the news about Tom J Lynch knocking back both Hawthorn and Collingwood happened to break in a week where both sides would benefit from Richmond being a bit distracted. The news that Lynch was locked and loaded at Tigerland – although, seriously, we’ve known this was happening for a while – blew up and created a lot of discussion this week about the impact free agency has had on the league. The conspiracy theorist in me would think that perhaps Hawthorn and Collingwood have known for a while which way this one was going, but saved leaking the news for the most opportune moment in the hopes it would get into Richmond’s heads. Or, maybe it was just a coincidence. Either way, it didn’t seem to trouble the Tigers at all. If anything, their fans have moved past dreaming of back-to-back and are already talking threepeat. Two years ago the Hawks were unceremoniously dumped out of finals in straight sets after a heartbreaking miss after the siren from Isaac Smith was followed by a rapturous upset semi-final win from the flag-bound Western Bulldogs. This year they face as simillar scenario as the Hawks will next week have to host the winner of tonight’s match between the Melbourne Demons and the Geelong Cats, and whoever it is will be coming in red hot and full of confidence. A hamstring injury to Ben Stratton last night looks set to rule him out for likely the rest of Hawthorn’s finals campaign – he could perhaps return in time for the grand final if the Hawks qualified, but any earlier would be a miraculous recovery. Losing a key defensive cog like Stratton will be a serious bow to Hawthorn’s hopes of stay alive, and even though they’ve had wins over both the Dees and Cats during this year, my gut feel is that whoever wins through tonight will end the Hawks’ season in a week’s time.